Nguyen Khac Phuoc Architects and Dang + Partners have slotted together 2,000 modular wooden elements to create a porous white pavilion for tea farmers in rural Vietnam. The pavilion is nestled amongst the Thanh An Tea Hills, a fertile region of northern central Vietnam where clusters of small islands in the Dap Cau Cau lake are cultivated for the production of green tea. Called Module+, the freestanding sustainable structure was designed by Hanoi-based Nguyen Khac Phuoc Architects (NKPA) in collaboration with fellow Vietnamese architecture studio Dang + Partners. The architecture studio chose to build the pavilion on a grassy strip of land situated between the lake and a gently sloping plantation hill to take advantage of the view across the water and close proximity to the farm. It is intended to function as both a gathering place for local farmers and a stop-over for visitors to experience "the peace of the land". Module+ owes its name to the 2,000, cross-shaped components from which it is constructed. At the tip of each arm of the modules are slots that enable the components to fit together at right-angles. The even distribution of forces throughout the structure removes the need for fixtures and adhesives, allowing the pavilion to be held together solely by friction. Each wall is five components thick, resulting in a scaffolding-like structure through which visitors can observe the surrounding agricultural landscape. 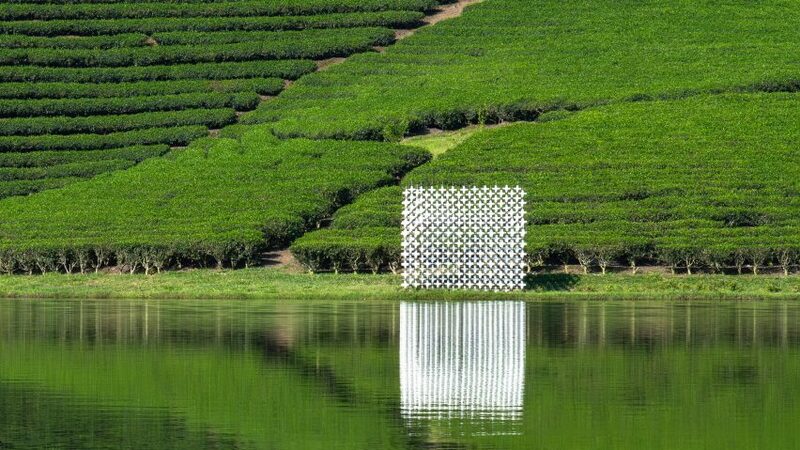 The pavilion is intended to visually disrupt the "scenic painting" of the tea plantation without having a negative impact on the area's ecosystem. The current freestanding structure has a rectangular footprint of six square metres yet due to the adaptable nature of its constituent parts, addition crosses can be added to enlarge the structure. "It can be expanded for different purposes in any location," NKPA told Dezeen. The modular components also mean it can easily be dismantled and moved to another site in the future. "It made sense for moving, replacing, supplementing, or making Module+ disappearing entirely in the future," said NKPA. All of the pavilion's parts were manufactured near the installation site before being transported to the island by boat and assembled by local labourers. "The building is easy to transport anywhere thanks to the small size of its basic components," said NKPA. "Because there are no technical methods to its construction, it is easy for members of the community to erect," claims NKPA, who maintain that involvement in the construction process not only empowers the pavilion's users but also "enhances the connection between people in the community". The idea that Module+ "works as a link between people, architecture and nature" echoes other projects completed by NKPA including A House in Trees, which offers its residents respite from noise and smog by way of two bamboo-filled voids at the centre of the property. Photography is by Trieu Chien.